Isaac C.J. and Stone and Linden JJ. 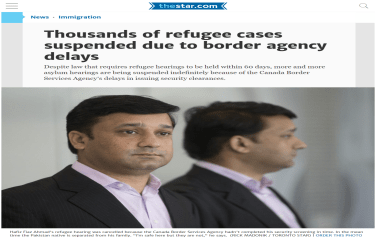 Aliens — Immigration — Refugees — Board’s findings — Administrative law — Judicial review. Application for judicial review. The applicant sought refugee status on the basis that he was being persecuted in his homeland in Iran because of perception on the part of state authorities that he had persistently printed anti-government propaganda in his shop. The Board found that none of the other 20 shops located in the town were ever targeted. The evidence of the applicant was that there was only one shop that was not targeted. HELD: Application allowed. The Board’s findings were based on a misapprehension of the evidence before it. The matter was remitted to a differently constituted Board. Max Berger, for the Appellant. Sally Thomas, for the Respondent.